Chicago Mayor Rahm Emanuel (D.) announced Tuesday that he will not seek a third term ahead of the February 2019 election. "As much as I love this job and will always love this city and its residents, I’ve decided not to seek re-election. This has been the job of a lifetime, but it is not a job for a lifetime," Emanuel said at a press conference, flanked by his wife. Emanuel served as a senior advisor to President Bill Clinton and chief of staff to President Barack Obama, with five terms as an Illinois congressman in between. In 2011, he resigned his position in the Obama administration to run for mayor, cruising to victory with 55 percent of the vote in a crowded field. Emanuel's popularity among his constituents plummeted in 2015 after the police shooting of young black man Laquan McDonald by a Chicago police officer. While Emanuel survived a progressive challenger in his reelection race, he faced calls for his resignation from black leaders once dash camera video released after the election showed McDonald was shot trying to flee. 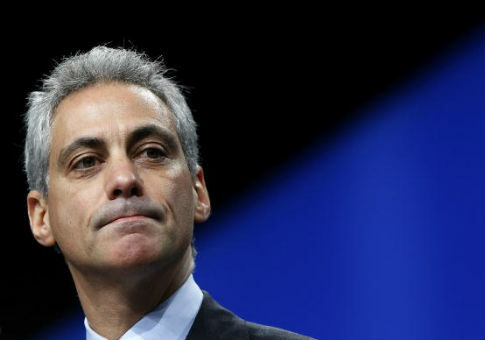 Internal polling showed that at his nadir, Emanuel was polling in "the low 20s," according to the Chicago Sun-Times. More recent polling done on behalf of Emanuel's mayoral election opponents showed he would still face a brutal race in 2019. One poll showed Emanuel's approval was only at 32 percent, while another found that only 31 percent would vote to re-elect him and 62 percent would vote for someone new. This entry was posted in Politics and tagged Chicago, Rahm Emanuel. Bookmark the permalink.